I appreciate you taking the time to read this letter. Frequently individuals in your situation have gotten to this point by one of two paths: (1) hidden sin has recently come to light, meaning you likely feel exposed and like everything is now moving very fast; or (2) pastoral care or small group care has stalled out, meaning you feel frustrated and are tempted to blame those around you for not being as effective as you believe they should have been to remedy your struggle. Regardless of how you got here, this is a difficult and pivotal season for you. Difficult because of the significant emotions and relational strains involved. Pivotal because how you respond to the matters that prompted church discipline will significantly impact your spiritual, social, and familial (if married) life for years to come. My reason for writing this letter is to help you engage the restorative care of your church in a manner that allows for the full redemptive effect that God intends. 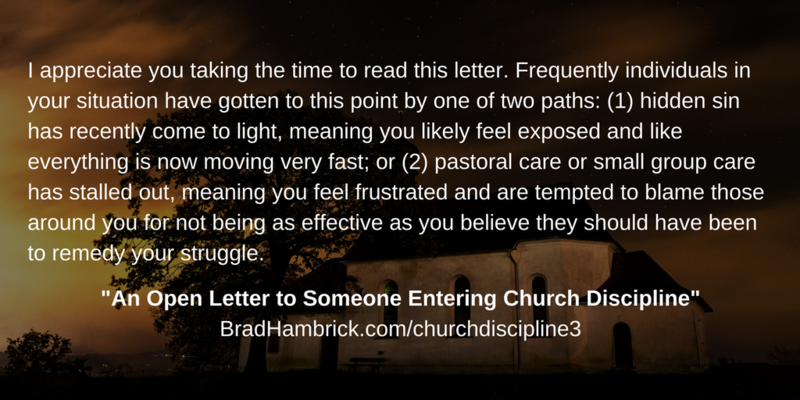 In the rest of this letter I want to address four common misunderstandings or complaints about church discipline that often distract the person under discipline. It is likely you will experience a multitude of emotions on this journey. There is a false (but understandable) logic that says, “If this is for my good, then it should feel pleasant.” Church discipline is one of those good things for which the positive emotional outcomes often do not come until the latter parts of the process. Below is an assortment of responses that are common during church discipline. They are listed to facilitate greater honesty between you and the church elder overseeing your disciplines process. You need to be able to be honest about what is hard without expecting the church to alter the discipline process. Think of these conversations like talking to a trainer overseeing your exercise regimen or a doctor over seeing cancer treatment. You want these people to understand BOTH what is hard for you in the process AND remain committed to accomplishing the objective. You want your elder to understand BOTH what is making change hard AND remain committed to restoring a Christ-like character in your life. Exposed – The restoration process involves many people in your life in meaningful ways. In time, if you cooperate, this will be seen as an act of love and support. Initially, it often feels like coming out of a dark movie theatre into the noonday sun. Ashamed – It is easy to think that everyone on your restoration team believes “they have their life together” and view you as the “broken or dirty one.” This is not true, but it is tempting to believe. It is common to feel shame when your shortcomings become known. Be careful not to project that shame onto how you believe others view you. Rejected – Christians side against immorality. Since your sin has you under discipline, it can feel like your Christian friends are rejecting you. However, in reality, church discipline is a rescue mission – which is the very opposite of rejection. There may be social awkwardness, from you and towards you, but this is true in any period of adjustment and should not be interpreted as rejection. Lonely – The person coming out of addiction often has to break with “old friends.” The spouse who is unfaithful misses their adultery partner and experiences strain with couple friends. Various sins create unique forms of loneliness as they are exposed and forsaken. The transition away from a “false front” and/or “unhealthy friends” results in a transition that is usually marked by a season of loneliness. This is why the church has surrounded you with a restoration team; these people provide both accountability and wholesome friendships. Angry – There are many things to be mad about: people whose sin isn’t public, consequences that you don’t agree with, the challenge of making changes in multiple areas of your life at the same time. This anger is understandable. But vet your anger with one simple question, “If I do what my anger compels me to do, will it drive me towards a more Christ-like character that results in a more flourishing life?” Don’t let “feeling justified” in your anger prompt you to make decisions that will create more pain for you and those who love you. Hopeless – The season you are in now may be the darkest season because the early stages of church discipline are when old habits/patterns are strongest, new habits/patterns are weakest, uncertainty is at its highest, and healthy social support is just emerging. This is truly a “it is darkest just before the dawn” season. Be honest about how you feel, but trust the God who wrapped you in a church more than your feelings. Other – This list isn’t exhaustive. It is meant to do two things: (1) provide an initial list of common experiences to prompt conversations about how you’re doing emotionally with your supervising elder, and (2) provide an example of how to talk about how you feel without sabotaging or dismissing the discipline process. There is no neat way to address a messy situation. While this complaint is common, it usually is more of a product of the situation than those leading discipline. You cannot clean up on oil spill without getting grimy. Church leaders cannot work with hidden sin, partial honesty, incomplete stories, and broken relationships in a seamless fashion. If you believe the process is not going well, the best things you can do are: (1) be completely honest, (2) cooperate fully and sincerely, and (3) share your concerns about gaps in your restoration plan in way that gives your church leaders the benefit of the doubt. Your church leaders will make mistakes and the process will not be maximally efficient. But – even though this may be hard to hear – the situation into which they are entering is the mess of your making; they are entering your mess out of a motive of love and for the purpose of restoration. If your concern is more about the imperfect process than the problem that prompted the need for discipline (it will be from time to time on this journey), this should be a warning that your flesh is distracting you from addressing your sin. There are two possible outcomes to church discipline. You will repent of your sin, cooperate with restoration, and have your first love for Christ renewed (Rev. 2:4). You will not cooperate with church discipline, continue in your sin, and be removed from church membership. How church discipline concludes will be based entirely on your choices. You will not choose option one or option two. You will choose to forsake your sin and embrace Christ or forsake Christ to embrace your sin. What you choose will shape how you view your church. If you choose to forsake your sin, you will view your church as a loving family who refused to give up on you and did everything in their power to lovingly restore you to Christ. If you choose to continue embracing your sin, you will view your church as a bunch of legalistic idiots who just want to run other people’s lives and use the Bible to justify their actions. Your choices about your sin will become the lenses through which you see your church. Again, your choices will determine the outcome of discipline and the trajectory for the rest of your life. My admonition to you in this letter is to not make these choices by passivity or happenstance. Soberly assess the choices you are making, what you believe honors God, and what cares best for those you love (Matt. 22:37-40); then choose accordingly. The previous point leads into this final point. I am going to assume that the choice you make in Point #3 was to honor Christ by forsaking your sin and cooperating with the restorative efforts of His church. If that is your choice, I want to give you one piece of advice that is essential to bringing that good choice to fruition – be honest. No life of lies is worth living. Absolute honesty is the “one step plan of change.” Be honest with yourself, God, and others. Doubtless, lies took you into sin; only honesty will bring you out. You will never be more free from sin than you are honest about sin. If I could give you one character quality to focus on as you seek to be honest, it would be stay humble. Sin does cloud the mind. Your interpretation of events (your own actions and the actions of others) is not to be trusted. This does not mean you are wrong about everything, but it does mean you need to be willing to be corrected about anything. If you are honest and stay humble as you cooperate with the restorative efforts of your church, I genuinely believe you will look back and see this season as one of the best seasons of your life (not most enjoyable, but most beneficial). It will be hard, but it is also worth it. Love God and love those dear to you well by allowing God to do what He desires to do in your life in this season.